The NZRU has announced a raft of new contracts for international players. 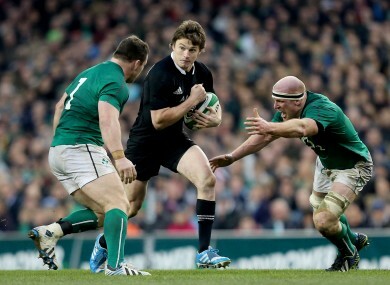 The attacking talents of Beauden Barrett will be remaining in New Zealand until 2016 at least. RUGBY’S TRANSFER MARKET is set for open season in the aftermath of the 2015 Rugby World Cup, when Top 14 and Japanese clubs are likely to be particularly ambitious in their recruitment. With that in mind, there has been much speculation that New Zealand rugby will lose the likes of Ma’a Nonu, Dan Carter, Richie McCaw, Jerome Kaino and Liam Messam after the global tournament. However, fears over the departure of the tier of players beneath those superstars have been eased further after six internationals extended their contracts until 2016. World-class Highlanders scrum-half Aaron Smith is chief among them, while skillful Hurricanes out-half Beauden Barrett has also agreed to a new two-year deal. Furthermore, TJ Perenara, Jeff Toomaga-Allen [both Hurricanes] and the Crusaders’ Dominic Bird and Matt Todd have all been pinned down until 2016. The trio of 110-Test veteran Tony Woodcock, fellow front row Charlie Faumuina and the Crusaders’ Tom Taylor have penned new deals that expire in 2015. The past season has also seen Kieran Read, Ben Smith, Owen Franks, Aaron Cruden, Israel Dagg, Sam Whitelock and Cory Jane agree to stay in New Zealand until 2017, when the British and Irish Lions visit. Younger international players such as Sam Cane, Brodie Retallick, Francis Saili and Charles Piutau appear to be the next priorities for the NZRU in terms of contracting, before their heads can be turned by lucrative offers from elsewhere. Email “Smith and Barrett among six All Blacks off post-RWC transfer market”. Feedback on “Smith and Barrett among six All Blacks off post-RWC transfer market”.